SIGNIFICANCE: The home of H E Rippon, owner of the Spectator and one of the most influential men in Hamilton's history. 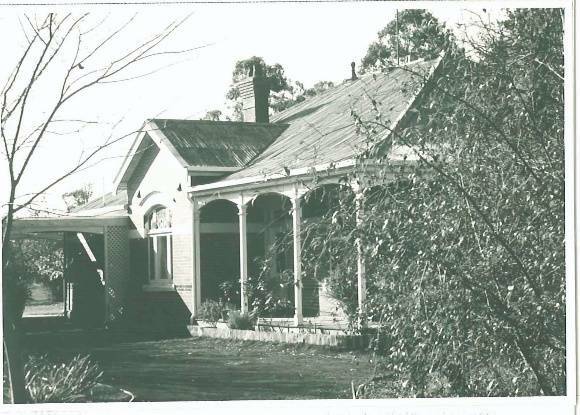 Edradour is one of the more substantial houses in the Ballarat Road and was designed by an important Melbourne architect, Gerard Wight with Frank Hammond supervising its construction. Edradour is of regional historic and architectural significance for its association with H E Rippon and as a design of Gerard Wight and Frank Hammond. Herbert Edward Rippon was the son of George R Rippon, a proprietor of the Spectator, Hamilton's long surviving newspaper. H E Rippon inherited his father's business interests and distinguished position in the community in 1899. (i) He was a member of the Hamilton Club, he was on various committees and his family led "society", at least in tennis and croquet. More seriously he was one of the original backers of Reginald Ansett and was a director of Thomson's Stores. (ii) He was always a conservative and the Spectator followed his line. The house was designed by the important Melbourne architect and engineer, Gerard Wight MCE, who is said to have modelled it on the home of the Melbourne City Council's Engineer's house. (iii) Wight (1860-1915) was in practice for forty five years. (iv) He was articled to the Victorian Railways' Engineers Department and to the leading firm of architects, Smith and Johnson. (v) He travelled in Europe with A E Johnson in 1891. Much of his practice was in partnership with William Lucas until about 1890 and he worked in association with other important architects with whom he won competitions. (vi) From 1898 he worked with William Pestell and together they won the competition for the Flinders Street Station. In 1885 Wight had won first prize in a competition for the St Georges Road bridge over the Merri Creek. Elected a Fellow in 1892, Wight was President of the RVIA from 1910 to 1913, concluding a most distinguished career. The house, Edradour, is modest and typical for its time being designed in the Federation style. It uses the typical materials, forms and details with an emphasis on the roof. The construction was supervised by the local architect, Frank Hammond and was built by Edward Tout for 1,500 pounds. (vii) It is significantly intact and is in good condition. The house is supported by what appears to be an original garden. It can be compared with its neighbours, Kenmure, 86 George Street and Kurrawong, 84 Ballarat Road. i Garden, D, Hamilton, p 131.
ii Ibid, p 212 & 213.
iii Conversation with Dr Blake Birdseye, the present owner, who holds the original drawings and specifications and relates a story told by H E Rippon's sister who sold him the house. iv All biographical detail is from Miles Lewis, Australian Architectral Index. v Arthur Louis Smith had designed the present National Australia Bank, 131 Gray Street 1n 1867 three years before Wight joined the firm..
vi William Salway; Phillip Hudson, Geelong C of E GS chapel, 1915.
vii Original drawings and specifications.